You'll find Da Vinci Science Center and Philip and Muriel Berman Sculpture Park within 2 miles (3 km) of this hotel. Dorney Park & Wildwater Kingdom and Cedar Crest College are also within 3 miles (5 km). This hotel features an indoor pool and a fitness center. Traveling on business? Take advantage of the business center and free WiFi in public areas. Enjoy the spa tub and free perks like buffet breakfast and free self parking. 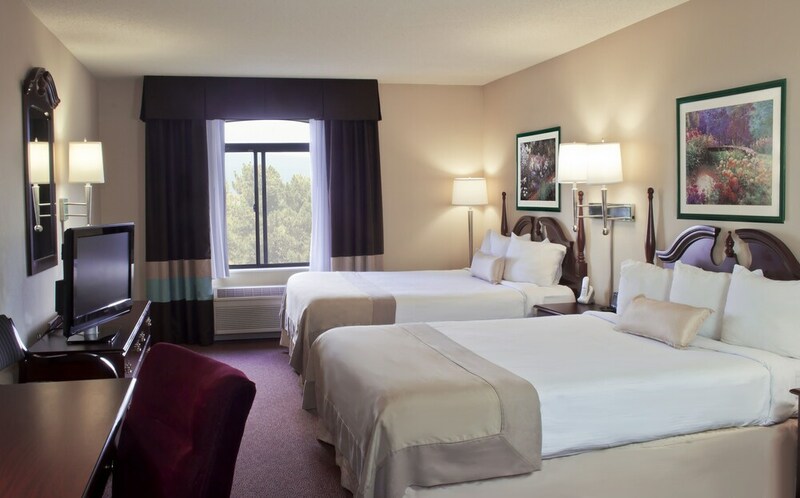 The 105 guestrooms offer free WiFi and free wired Internet, flat-screen TVs with cable channels, and microwaves. Other amenities include free local calls, showers, and ironing boards. the mattress on one side had a deep soft trough from too many guests without being changed out. Cons: A better way to assure rooms are ready for arriving guests. First room had condom wrapper in the floor. Water access panel open above bathtub. Water in sink dripping. Front desk was quick to offer another room. Second room had part of bathroom door water damaged and some type of mold growing. Good people working but someone needs to review their quality control system. We were rather disappointed with this hotel. We stayed 1 night and although the staff was pleasant and the overall appearance of the hotel was good, the mattresses in our room were horrible. 1 of them had a divot in it so large that you couldn't help but roll into the hole constantly. The hotel is also situated next to a highway on both sides so no matter the room you will hear highway noise. Stayed here for one night while traveling to NJ. The hotel was nice and clean. I picked it based on the reviews, and it was a good choice. Aside from a couple cosmetic issues here or there, this hotel is well worth its nightly rate. Comfortable rooms. Nice staff. Just off I-78 and two minutes away from Dorney Park. Rooms even have microwaves and refrigerators! Hot waffle breakfast every morning included! And free wi-fi! Hard to beat in this area for the value. The room was clean and comfortable. The health club room and pool was unclean and unairconditioned. The pool and jacuzzi water was green and could not see the bottom. Friendly, at ease - not stuffy, convenient and reasonable. Relatively new so nothing worn out. Stairs you can use for more than just exiting - better exercise and less waiting on elevators. Spacious lobby. Manager night - food & drink. Cheers. This property is undergoing renovations until 30 April 2019 (completion date subject to change). Wingate by Wyndham - Allentown PA offers its guests an indoor pool, a spa tub, and a fitness center. Public spaces have free WiFi and wired Internet. You'll find a business center on site. Free breakfast is served daily. Event space at this hotel measures 1300 square feet (121 square meters) and includes conference space. The business-friendly Wingate by Wyndham - Allentown PA also features complimentary newspapers in the lobby, laundry facilities, and dry cleaning/laundry services. Self parking is free. This Allentown hotel is smoke free. Wingate by Wyndham - Allentown PA offers 105 air-conditioned accommodations with irons/ironing boards. Flat-screen televisions come with cable channels. Bathrooms include showers. This Allentown hotel provides complimentary wired and wireless Internet access. Business-friendly amenities include desks along with free local calls (restrictions may apply).